Carlos was a supremely talented racing driver, who at his best was untouchable, but he could just as easily turn in a performance of overwhelming mediocrity as he could reduce a field of the best drivers in the world to bit players. Never was this more apparent than at the end of 1981 when, poised on the brink of the World Championship and after clinching pole position in brilliant style, he faded badly to eighth place in a race in which he only had to place ahead of Nelson Piquet - who finished the race semi-conscious in fifth place - to take the title. Carlos made a sensational Formula One debut in 1972, after placing second to Ronnie Peterson in the European Formula Two Trophy in 1971, putting his Brabham on pole position before finishing seventh. The following season saw him establish himself as a consistent top-liner, and he started 1974 in brilliant style, leading the first two races until mechanical problems intervened, and winning the third, before his form tailed off until August, when he recovered to win the Austrian Grand Prix in brilliant style. Two more up-and-down seasons followed before he joined Ferrari for 1977, where he was overshadowed by Niki Lauda, and 1978, when he was back to his best alongside Gilles Villeneuve. 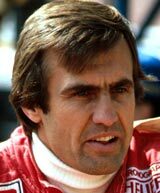 Reutemann took four wins that year, only two less than world champion Mario Andretti in the dominant Lotus 79. A switch to Lotus for 1979 proved ill-judged, but the move to Williams in 1980 was not. He ably backed up Alan Jones to the title that first year, before mounting his own challenge in 1981. For most of the year it looked a certainty that he would tie up the championship well before the end of the season, but then came the almost inevitable slump. He returned in 1982, took an excellent second place in the first race, in South Africa, and then quit after the second. He is now a leading figure in Argentinian politics, and since 1991 has been the governor of the country's largest province, Santa Fé.